Add a soundtrack to your off road side by side UTV adventure with one of our custom speaker pods. speaker products are a full line of custom made speaker pods designed to fit the most popular UTV's on the market including Polaris, Kawasaki, Honda and many others. Each stereo speaker pod houses (4) 5 1/4" speakers and is built as tough as nails just like your side by side. 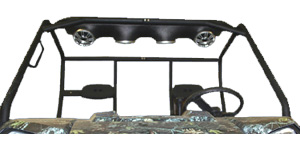 Install Waves & Wheels Side by Side UTV speaker products into your UTV now!